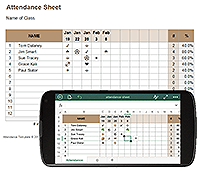 Need a free attendance sheet for tracking attendance at meetings, clubs, work, school, or church? 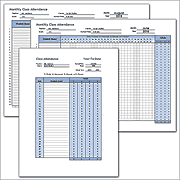 We have a number of different types of attendance sheets as well as sign-in and sign-up forms. 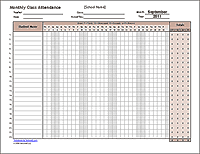 If you are a teacher wanting to track student attendance, try the school attendance tracking templates. If you'd like free printable attendance sheets for passing around at your meeting, try the Meeting Sign-In sheet. If you'd like to print a sheet to track visitor attendance at an open house, volunteer service activity, or museum, try the Visitor Sign-In sheet. The following pages contain multiple templates that you can customize using Excel. There are also some printable PDFs such as blank attendance and sign-in forms. This simple attendance record template can be used to print blank attendance sheets and for recording attendance for clubs, church, Sunday school, and other meetings. This collection of templates includes a few different printable attendance sheets for meetings, visitor sign-in / sign-out, workshops, seminars, conferences, offices, etc. Timesheets & Timecards - A few different time sheet templates for tracking your hours worked. Free Timesheet Template - A very simple time sheet for tracking your employee attendance. Employee Vacation Tracking - This template lets you track employee vacation, sick leave, and personal leave. Schedules & Planners - These schedule and planner templates are great for helping you management your time.